What will Purina think of next? Check out our new equine electrolyte supplements now available at Lochte Feed & General Store! 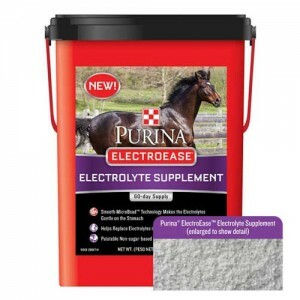 Purina® ElectroEase™ Horse Electrolyte Supplement is a unique electrolyte complex that provides a palatable source of electrolytes in proportions typically lost in sweat. It helps maintain hydration and has a coating that makes the electrolytes gentle on the stomach. Want to SAVE on your next purchase of Purina Supplements? Click here for coupons! This entry was posted on Friday, February 15th, 2013 at 2:36 pm	and is filed under News & Updates. You can follow any responses to this entry through the RSS 2.0 feed. Both comments and pings are currently closed.